As the Narendra Modi government completes one year in office, Rediff.com speaks to eminent personalities to analyse the first 365 days of the government. In the third article in the series, Shobha Warrier/Rediff.com spoke to Mankombu Sambasivan Swaminathan (bottom left), the father of India's Green Revolution. For almost two decades you have been saying the Indian agricultural sector badly needs the attention of various governments. Though every finance minister lists out many measures to revive the agricultural sector and stop farmers from committing suicide, the ground reality has not changed at all. Your comments, please. Yes, it is true. Political parties only pay lip service to agriculture. Before the elections, Narendra Modi also said, achche din aanewale hain (good days will soon be here). Farmers are in majority here and their votes are important. However, it is sad that no positive steps have been taken to change their predicament. Poverty and malnutrition are still rampant in India. Because of El Nino, we do not know how the monsoon will be this year. There are a number of imponderables in agriculture. According to the latest report, farm production this year is five per cent less compared to last year. I had expected more production because of irrigation and alternative strategies. Agriculture is in distress and so are the farmers. Do you think achche din will come in agriculture? Achche din can definitely come if you implement the ideas well. Achche Din came in the 'sixties when the situation was extremely bad, rather worse than what it is now. But through intelligent use of technology and public policy, achche din came. The prime minister has initiated a major programme on irrigation since water security is fundamental to food security. He has also promoted greater attention to soil healthcare through the provision of Soil Health Cards to all farmers. Unfortunately the weather god has not been kind. Droughts, floods, hailstorms and unseasonal rain have all led to the decline of total food production in 2014-15 to a four-year low of 251.12 million tonnes. The weather is not under the control of the government but weather management definitely is. What is the status of India’s agriculture sector right now? The recommendations made by the Farmers’ Commission from 2004 are in cold storage; starting with simple things like changing the name of the ministry of agriculture to the ministry of agriculture and farmers’ welfare. We hoped to make the bureaucrats realise what the ministry is actually meant for. In the report, we had recommended that the minimum support price (MSP) should be the total cost of production plus 50 per cent. Unfortunately a recent panel set up by the Government of India has recommended only a margin of about 10 per cent more than the cost of production. There is no other profession which has such low returns. The future will belong to nations with grains and not guns. Further, agriculture is the major backbone of our country and this is why I urge the government to implement our recommendation on MSP. This is the only way to attract and retain youth in farming, bring small farmers out of the poverty trap and to ensure sustainable food security. I presented a National Policy for Farmers in 2006 and it was placed in parliament in 2007 but has not yet been implemented. Action at the ground level is limited. There is also a need for Panchsheel for agriculture. First is soil -- there should be a special agriculture zone like the SEZ, which takes away good farm land for non-farming purposes. Then comes water. I have recommended that rain water harvesting must be made mandatory in the fields. We call it jal kund and there should be equity in water sharing. Third, credit should be available to farmers. Fourth is technology and fifth is assuring a remunerative market. In reality, the government is reducing procurement and the hapless farmers are left to face market vagaries. Nowhere in the world agriculture is thrown to the market. If you take the case of the United States, the subsidies are very high for farmers. While American and European governments have found methods to bypass WTO (World Trade Organisation) measures, we have not done anything of that sort. 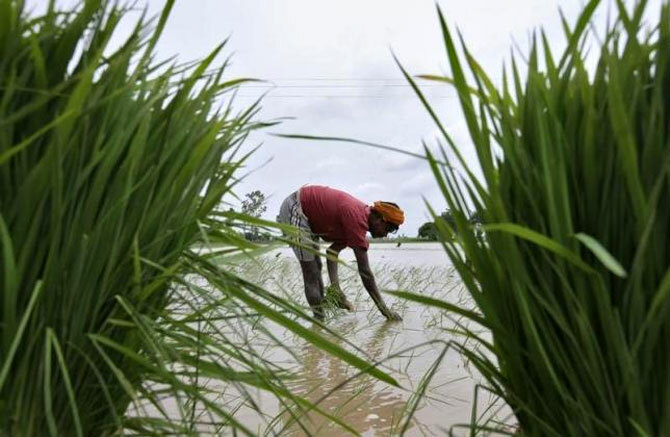 In support of the land acquisition bill, some economists say that since agriculture has become unsustainable for small farmers, they should be moved to the manufacturing sector so that their livelihood becomes better. Do you agree? Eisenhower once said, agriculture is easy if the plough is your pen and you are located some 1,000 km away from the field. That is what these economists do. For them, plough is their pen and they feel agriculture is very easy. Also, where is the market for alternative products? In the US, where there are technology driven large farms, only two per cent of the population is involved in agriculture. Whereas in India, small farmers account for more than 50 per cent of the population. Do you feel it is high time, we also move to profitable, technology driven large farming? We should see what China has done. China is also a land of very small farmers. In areas like water management, water harvesting, etc, groups of farmers in a village work together and working cooperatively and collectively has helped them immensely. Do you feel small farms have become unsustainable in India as everyday we hear about farmers committing suicide? That is because 60 per cent of our land is not irrigated. They solely depend on rains. Water harvesting becomes difficult for small farms. In the Farmers’ Commission report, I myself wrote a chapter on farmers of the 21st century and asked the question, how do you get scale? You can emulate Verghese Kurien who opened milk cooperatives, which made India the largest producer of milk in the world. Alternatively, you can form a company. There are many methods by which you can make farming profitable. When we made millet village and pulses village, we made people co-operate and farm by sharing water in an equitable way. In Kerala, women working for Kudumbasree engage in cooperative farming and it is very profitable. Can’t this be replicated in the rest of India? Yes, something of this model can be replicated. But in north Indian villages, women’s status is very low. They are not as aware as their counterparts in Kerala. But farmers can come together, manage water, pest and diseases, and also have post-harvest technology. The social engineering aspect of agriculture must get as much attention as technological aspect. Social engineering is bringing people together as a cooperative. In 2011-12, when the national agricultural growth was less than two per cent, Gujarat had achieved 12 per cent growth. How was that possible? All thanks to irrigation… That is why the prime minister announced a national irrigation policy. If it is implemented, it can change Indian farming. If there is water, you can apply fertiliser and grow more crops. Do you feel the new land acquisition bill will hurt the farmers? This Act is not for agriculture but for other development purposes for which land is needed. They say they will give fair compensation to the farmers. I have put up three suggestions, which should be fulfilled while acquiring land. The first is, it should not erode our food security system. Look at what (Andhra Pradesh chief minister) N Chandrababu Naidu wants. He wants to take away all the delta areas to build the capital. Second is, it must be for a public project and not private purpose. The third is, not only the farmer but his wife, too, should be consulted because they are the ones who know the value of land. A farmer’s concern also is a woman’s concern. At the time of Green Revolution, there was a gap between need and production, and in your words, there was food insecurity. Are we facing food insecurity now? There is no gap between need and production. It is a question of economic access to food, ability to buy. Aspects of food security are availability of food which is okay and the other is ability to buy and also the ability to absorb food in the body which depends on clean water and sanitation. Unless availability, access and absorption come together, there will not be food security. Even if you eat a lot, if your water is contaminated, you will have diarrhoea and you won’t absorb the food. You mean there is no food crisis? Crisis is there, a serious crisis, but it is economic crisis in the farm. We had made a few recommendations. One was pricing in the procurement policy. Second, credit should be four per cent or less. Thirdly, there should be a single Indian market and there should be no restriction in the movement of goods. Food Corporation of India was started with the purpose of helping the farmers. Has it become redundant now? Yes, it was started to help the farmers. Over the years it became very big. Now there should be smaller FCIs because the overhead costs have become high. FCI had done a very valuable job in the beginning. When you announce a procurement price, you have to have a mechanism to implement it. How do you assess the first year of Narendra Modi from the perspective of agriculture? It is rather premature to judge the performance of the government in the farm sector. Unfortunately, suicides by farmers have not stopped and agrarian distress has become more severe. Production has come down by five per cent but that is not because of the government but because of the weather. It is a national shame that the only country that enacted a food security act that gives its citizens right to food, is now better known as the land of farmer suicides. But our urban population and some economists are not very sensitive to farmers. Achche din will come if they implement the recommendations of the Farmers Commission. There is no other way for the government as any government’s first responsibility is to feed its people. 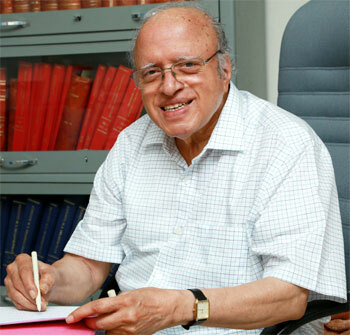 Photograph of M S Swaminathan by Sreeram Selvaraj.